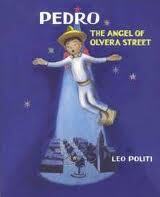 Pedro The Angel of Olvera Street, a 1947 Caldecott Award recipient, again indicates to me the interest at the time of this writing in learning about other cultures. Written and illustrated by Leo Politi, this story is about life in the Mexican community on Olvera Street in Los Angeles. While the storyline seems disjointed, the little boy’s love for music is evident throughout the book as he sings for his grandfather, participates in a Posada celebration at Christmastime, and wins a beloved music box after striking a piñata. 1. “Excellence of execution in the artistic technique employed.” – The Latin, New World watercolor style is not pleasant or interesting to me. 2. “Excellence of pictorial interpretation of story, theme, or concept.” – Given that the only theme I could really follow was that of music I wished that the musical theme would have been more evident pictorially. There are a couple of (I am not fond of the trend toward leaving out this preposition.) simple musical scores in the middle of the book, but pictures of the music box are poor. 3. “Appropriateness of style of illustration to the story, theme or concept.”- The colors in the illustrations have a definite Latin flair and are simplistic, possibly illustrative of what might be seen through the eyes of a child. Be that as it may, I would have appreciated even more use of color and more details. 4. “Delineation of plot, theme, characters, setting, mood or information through the pictures.” – Near the beginning and end of the book the pictures are helpful in depicting plot, theme, and characters, etcs, but in the middle they do not even seem to correspond to the storyline. 5. 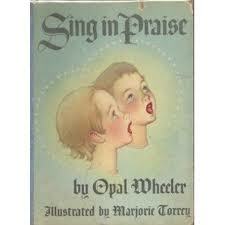 “Excellence of presentation in recognition of a child audience.” – The only reason my children connected at all with this book was that they had recently seen a play that included a Mexican Posada. 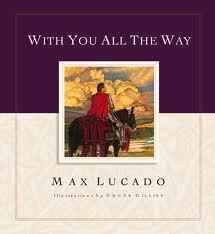 With You All the Way, a picture book by Max Lucado, offers many opportunities to teach valuable lessons through reading. In this story a king offers marriage to his daughter to any one of his three knights who can travel through a dangerous forest following the sound of a specific flute. A strong knight, a quick knight, and a wise knight are each allowed to take one companion along for the journey. In the end, the end the wise knight emerges with his travelling assistant, the prince. In relating the harrowing experience, the wise knight notes that the only way he was able to make his way safely through the forest was by listening to the true sound of the flute over all of the noises in the woods that mimicked the real call. Pros: A great way to teach children about the value of wisdom over other attributes, choosing friends wisely, and watching out for counterfeits when seeking after God’s way. 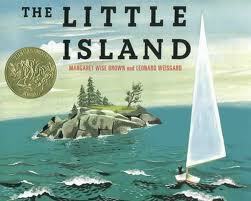 The 1947 Caldecott Medal Book, The Little Island by Golden MacDonald and Leonard Weisgard, is a well-known children’s classic. This book tells what this small island experiences through each season, each time of day, and in different types of weather. Animals and plants that inhabit the island play large roles in the story. In the middle of the book, though, a boat visits the island, leaving a kitten behind. Although I have not had much experience with pleasure-boating, I do not think I would take my cat along on such a trip. Also, then, the cat and the island have a conversation discussing if the island is really a part of the world. While I really enjoy the beginning and end of this book, the middle does seem very peculiar and out of place in the overall story. 1. “Excellence of execution in the artistic technique employed.” – The water color illustrations depict life on a beach beautifully. Since the author was from the coast of Maine, that is the locale she and the illustrator had in mind when this book was written, and that is exactly where these seaside scenes look like. 2. “Excellence of pictorial interpretation of story, theme, or concept.” – The pictures do a great job of following the storyline. 3. “Appropriateness of style of illustration to the story, theme or concept.”- The greens, blues, and browns make these illustrations perfect for this ocean-themed book. 4. “Delineation of plot, theme, characters, setting, mood or information through the pictures.” – The setting and theme are very clear, but the plot and characters seem less evident. 5. “Excellence of presentation in recognition of a child audience.” – My children like this book and particularly enjoy learning more about sea life that we do not get opportunities to see in western Kansas. 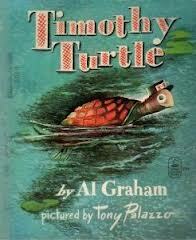 Timothy Turtle, a 1947 Caldecott Honor Book, was written by Al Graham and illustrated by Tony Palazzo. Timothy, the successful owner of a ferry landing, yearns for fame and excitement. When his friends encourage his desire for adventure he sets out to climb a nearby hill – a daunting quest for a turtle. Upon his journey a rock falls on him and causes him to land on his back. After much concern and movement he is able to flip upright and begins to make his way home. When he reaches the bottom of the hill, he is greeted by his friends who are cheering for him. He realizes that he really is content with his peaceful life on the river. 1. “Excellence of execution in the artistic technique employed.” – The ink line drawings with chalk background of blue and peach on alternating pages are amazingly detailed. The lines on the turtle’s back, the duck’s feathers, and the pine tree were particularly interesting to look at. 2. “Excellence of pictorial interpretation of story, theme, or concept.” – The story is easy to follow through the pictures. 3. “Appropriateness of style of illustration to the story, theme or concept.”- These illustrations are exactly as I would imagine a turtle might see in the world around him from his perspective. 4. “Delineation of plot, theme, characters, setting, mood or information through the pictures.” – All of the characters, setting, and plot were easy to understand through the illustrations. 5. “Excellence of presentation in recognition of a child audience.” – My children liked the pictures in this book as well as the overall story, but some of the old-fashioned language was difficult for all of us to follow. Recently I reviewed When I Was Young in the Mountains, written by Cynthia Rylant and illustrated by Diane Goode as a recommended read. (See that post at https://littlebooksontheprairie.wordpress.com/2013/01/30/when-i-was-young-in-the-mountains-by-cynthia-rylant/) This book was nominated as a Caldecott Honor Book in 1983, so I would like to now review it from the aspect of the illustrations. 1. “Excellence of execution in the artistic technique employed.” – This book has lovely watercolor illustrations. The details, especially in the faces of the grandparents, are remarkable. 2. “Excellence of pictorial interpretation of story, theme, or concept.” – The family scenes are poignant, but it lacks the majestic mountainous scenes I would expect from the title. 3. “Appropriateness of style of illustration to the story, theme or concept.”- Other than the missing mountains, these pictures easily remind me of times spent in the Appalachian Mountains. The love that the grandparents and children have for each other is very evident. 4. “Delineation of plot, theme, characters, setting, mood or information through the pictures.” – The overall plot could be missed by just looking at the pictures, but the theme, characters, and setting are well-detailed. The mood, however, is a bit confusing as it seems that the children are frequently pictured as sad, but the text only refers to happiness. 5. “Excellence of presentation in recognition of a child audience.” – While my children enjoyed this book, I do not think it was due to the illustrations.